Joe Quinones' interweb-log: DOCTOR ORPHEUS! I don't know how many people out there watch the show, but I absolutely love the Venture Bros. For those who don't know, "The Venture Bros." is a cartoon on Adult Swim that parodies the classic Hanna Barbera cartoon, 'Johnny Quest' as well as comic books in general. It's really quirky and fun, and has some great animation. 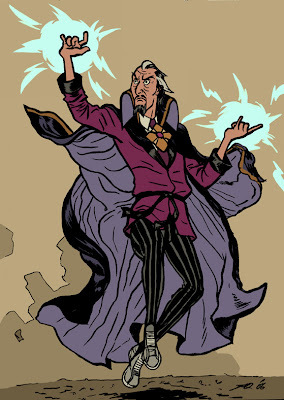 Anyway, the character above is a parody of Marvel Comics' Doctor Strange and a favorite from the show. Venture Bros. ... best show ever! good illustration man, love the color choices (very card board). When does your next book come out? So I tried to find my friend code so our Miis could hang out and high five or whatever it is Miis like to do, but I'm at a loss on how. Help? My favorite is Dr. Girlfriend. There is something so disturbingly hot about her.